Anthony Atamanuik is making a pretty good living out of playing Donald Trump. 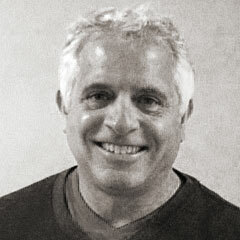 In fact, he parlayed his comic riffs into a full-time 20-episode gig on Comedy Central. 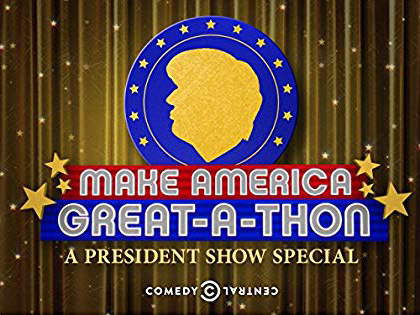 One of those episodes, a special called The Make America Great-A-Thon was recently shot at Manhattan Center’s TV-1. Said the telethon host to Deadline.com: “Since Robert Mueller won’t let me do my show any more (WITCH HUNT! ), failing Comedy Central BEGGED me to keep doing specials. And I know how to make money. I have been making money my whole life. Which is why I’ve declared bankruptcy four times.” For some background, Atamanuik did his first take of President Trump as Candidate Trump during an improv show at Upright Citizens Brigade in New York. As he told CNN, “He announced on my birthday, on June 15, and I thought it was pretty silly at the time,” Atamanuik recalled. Lots of reporters and commentators felt the same way. “But by August, I was like, ‘Well, this guy’s for real.’ And I thought it would be funny to do him,” the comedian said. Atamanuik continued, “It’s a talk show that is from the perspective of Donald Trump, that he’s hosting, but it’s how he would host the show. So the show is living in the zone of like a Steve Allen or Johnny Carson because that’s Trump’s zeitgeist. The approach can be summed up as ‘art political comedy,’ or ‘comedic activism’. We try to litigate him through his inner self.” Starring along side Atamanuik, was Kathy Griffin, taking a convincing turn as Trump’s Special Counsel to the President, Kelly Anne Conway. You might call it a comeback of sorts for Griffin. She had what one could call a “rough patch” when she did a photo shoot while holding Trump’s head. (The problem was it wasn’t attached to the rest of his body.) During the shooting of the Make America Great-A-Thon, we find Trump, the junior Trump and VP Pence (played by Executive Producer Peter Grosz), raising money for important causes including: the wall, the “Trump Foundation for Childhood Cancer Research and Golf Course Development” and “The Straight Scouts”. As he introduced Conway, noted a recent piece in Vanity Fair, Atamanuik’s “Trump” declared that his counselor had “absolutely no conscience”—which Griffin-as-Conway proved by defending figures including Bernie Madoff, Charles Manson, and Jeffrey Dahmer: “At the end of the day, Jeff is just a foodie. A salt-of-the-earth, a flesh-of-the-human kind of guy. And our workforce could use more Americans with that kind of appetite for life.” “I could do this in my sleep,” added Griffin-as-Conway. “If I slept.” With art almost imitating life, the situation grew tense near the end of the telethon when a surprise subpoena shook up the proceedings. In an attempt at an “all’s-well-that-ends-well” finale, the crew tried to raise enough dough for a rapid getaway. But alas, the FBI showed up in time and got its man. Sorry, Donald. It all went down at Manhattan Center. Home to TV-1 — and great New York event spaces.